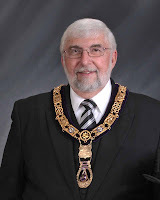 The Worshipful Master of St. Joseph Lodge No. 970, Tracy Hogan has invited the Brethren of Ogden Lodge No. 754 to attend a 3rd Degree on Friday, January 11th at St. Joe. The degree will be conferred by Grand Master of Illinois Terry Seward. The meal will begin at 5:30 and the degree will begin at approximately 6:30. It's not every day you get an opportunity to witness a degree conferred by the Grand Master, and I'd like to thank WB Hogan for the invitation, and hope to see you all there.